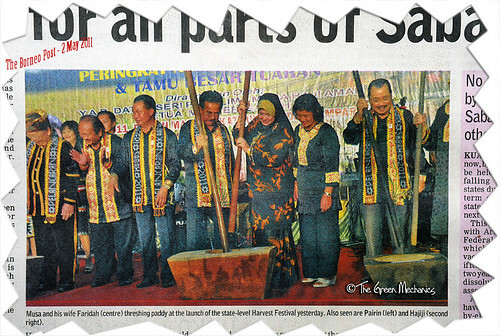 Chief Minister Datuk Musa Aman kicked start the Kaamatan in Tamparuli. He is also expected to officiate its conclusion on 31st May 2011. I would probably be sharing mostly pictures of the opening and closing (or peak) ceremony of the month-long Harvest Festival, and not the faces of the winners of the Unduk Ngadaus as many would perhaps expect. 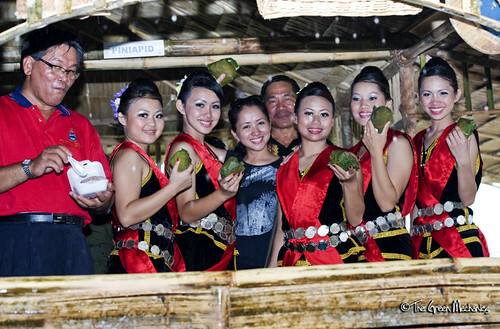 In Sabah, one can feel the celebratory mood from 1st May to 31st May every year partly due to the various cultural and non-cultural events by both government and NGOs, and partly to the shopping carnivals organised by the big malls in the city. The general public play their part too by writing, blogging, taking part, and donating for the cause during the month. 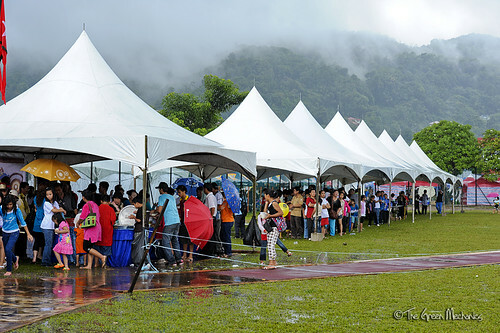 Rain-soaked opening ceremony did not deter visitors from crowding the small town. 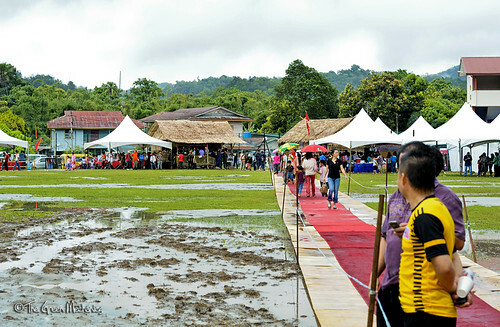 In between the dates, the more than 40 districts and sub-districts would hold their own festival which would normally be marked with the crowning of the Unduk Ngadau and Sugandoi champions. In the normal case the Unduk Ngadau (Harvest Festival Queen) would represent their respective district at the state level Kaamatan on 30th-31st May, traditionally held at KDCA Hongkod Koisaan in Penampang. Citing an example of the Tuaran district level celebration, people of different cultures convene in the true spirit of solidarity, putting aside their differences in religious beliefs and political ideologies and sit back to enjoy the moment. While I can testify for the truthfulness of the high level of religious tolerance in Sabah, I can't assure myself about the latter. But then again that is the sad truth of what is happening in Malaysia in general; leaders of different political ideology seldom sit together to work for the people. "My role is nothing else but to discredit my opposing team, from this election to the next". Ladies handing out the Linopot, a traditional Dusun staple. It's mainly rice with thick blend of yam. Other areas in the state use different blends for variety and for uniqueness. 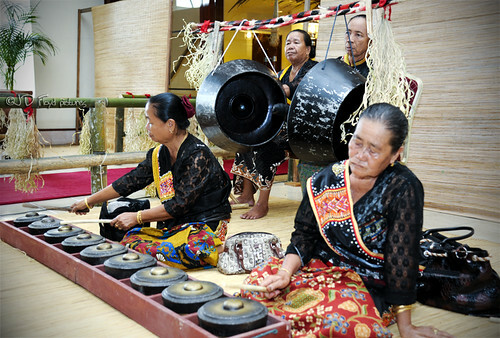 Beating the gong and kulintangan (an array of smaller gongs) by the Lotud community. 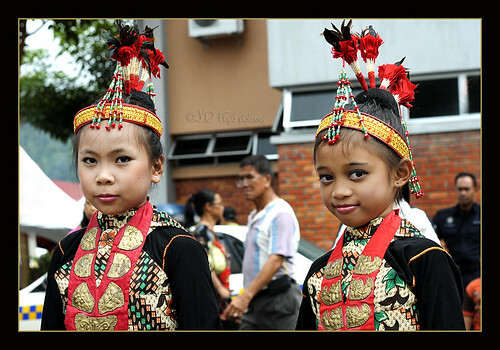 Kids wearing the Lotud traditional costume:- the Siwot (head ornament) and the Mandapun (red cotton collar with embossed gold plate). 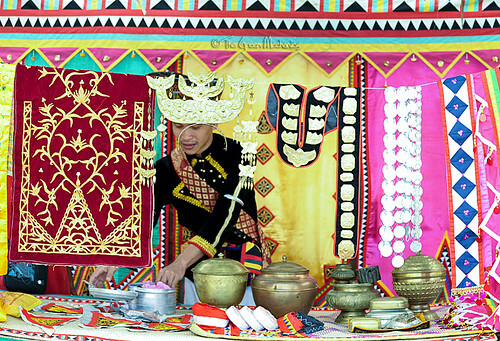 Find more about the Lotud Traditional Costume here. 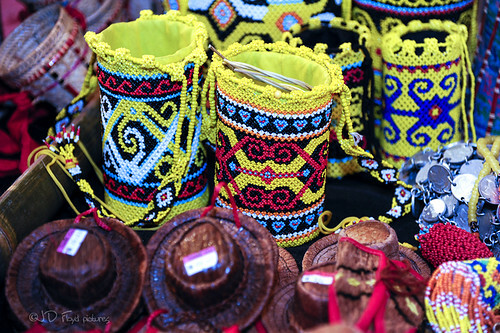 Bajau traditional costume with jars and kitchenware. 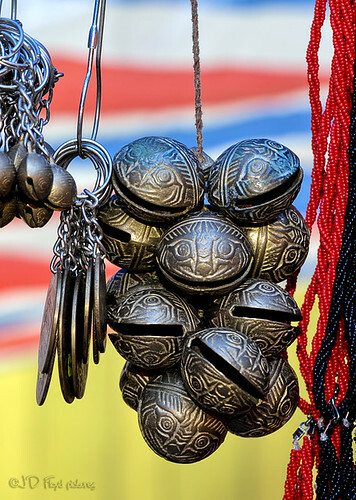 Metal traditional accessories of the Kadazandusun. 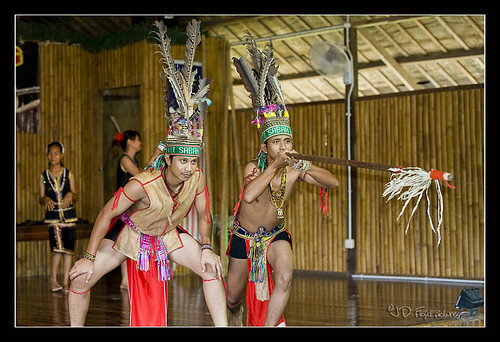 Headhunters of Borneo?The blowpipe, locally called Sumpit is popular among the native Murut and Lundayeh, and is used as a hunting tool for live food such as birds, mouse deers, squirrels, and wild boars. 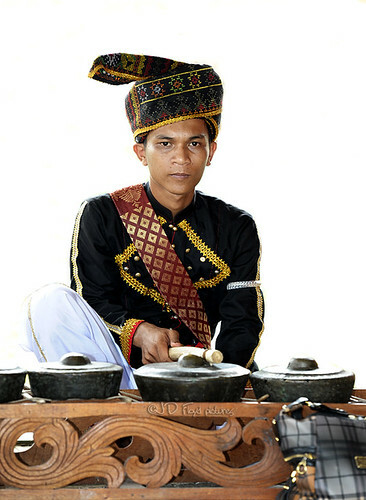 In Bajau language betitik means beating of traditional musical instruments such as kulintangan, tawak, bandil and gendang. The betitik regained its popularity following more aggressive promotion exercise by the state's cultural board since a couple of years back. 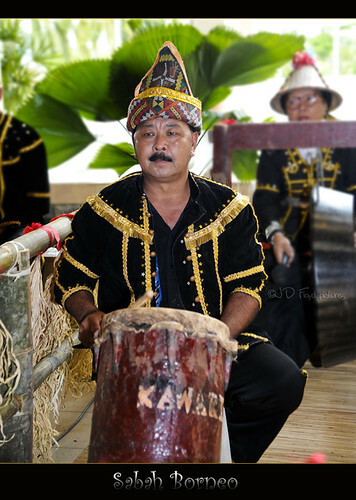 The gendang is an important component of the gong beating orchestra of the ethnic Kadazandusun in Papar. 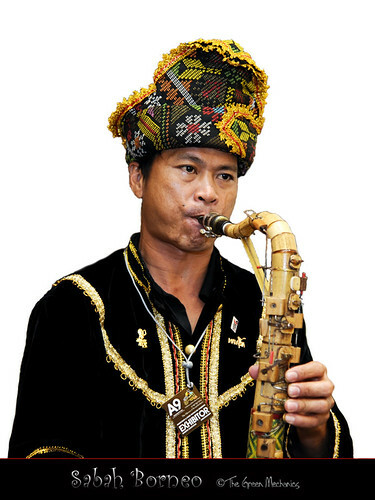 Creative locals produced saxophone of their own. This one is made of bamboo and if you are familiar with the modern saxophone you will be amazed by the built quality and the pitch tuning precision of this instrument. 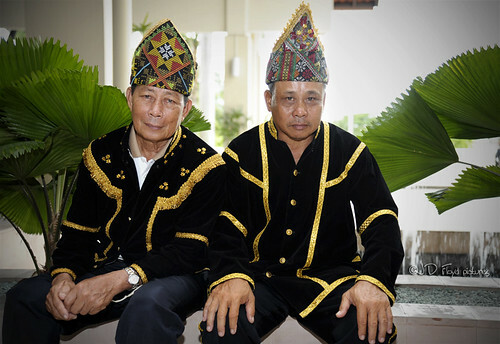 Gentlemen from ethnic Kadazandusun in Papar, Sabah. Handwoven beads baskets trimmed down in size suitable for decoration. The motifs here are popular among the Murut and Lundayeh communities in Sabah. Beliur sia tingu itu Linopot. Floyd (eh, ur name is Floyd kan? ), I love all the photos. One with saxophone really attracted my attention. Do yo have any idea what are those metal 'lonceng' used for? Cheers mate! Kotobian Tadau Tagayo do Kaamatan 2011 kumaa dikoyo sanganak-anak. Aramaiti! Rindu juga saya sama pesta kaamatan ni.